So said Floyd Mayweather during the post fight press conference after besting Conor McGregor in the tenth round of their much ballyhooed boxing match. “Number forty nine wasn’t good enough,” the 50-0 fighter claimed. “Number forty-eight wasn’t good enough.” Here was a man who wanted to leave the ring in memorable fashion. “I told you I was going for the knockout” he said to the gathered media. Mayweather was gracious regarding McGregor. 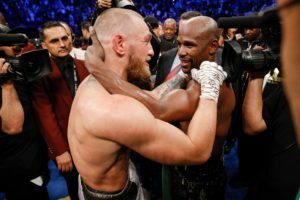 “He was a hell of a fighter standing up,” he said, admitting the Irishman “kind of shocked me.” Mayweather still brought up McGregor’s dirty tactics throughout the bout, however. He also brought up McGregor’s notorious (no pun intended) big mouth. “Talking doesn’t win fights,” he said. “Fighting wins fights.” Mayweather went on to point out that he felt McGregor was wrong for complaining that referee Robert Byrd stopped the fight too soon. “The referee is thinking about your future,” he said. It was clear Mayweather felt right at home in front of the media, but after a while, McGregor showed up and Mayweather graciously stepped away from the mic. The two men embraced once more and posed for pictures, effectively ending the entire months long affair on a high note. What Happened To Adrien Broner? He seemed on top of the world once, not so long ago, a terrible representative or the sport who was on his way to stardom, nonetheless. 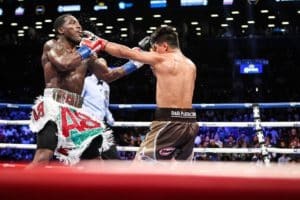 After being dominated this past weekend in New York by Mikey Garcia, many are left asking what happened to Adrien Broner. This was the future celebrity, the Mayweather with a bad/worse attitude, the soon to be face of boxing. Now, though, it’s clear the man can’t beat an above average opponent. All that talk, all that hype, and for what? For three losses in a row to big names? For smack talk after defeat? For endless acts of stupidity outside the ring with little to show in the way of real merit inside of it? This isn’t what the public was led to expect. Oh, the public was led to expect bad behavior when it came to Broner, of course. In fact, the public was expected to celebrate it. For Broner was supposed to be the big mouth who couldn’t be shut up, the man who appealed to people’s inner mean streaks, the guy who acted like many amoral types wished they could have, but were afraid to. Yet the public was also led to expect Broner to back it all up with big win after big win. Thing is, with the possible exception of Paulie Malignaggi, who some feel actually won their fight, Broner has no big wins to his name. What he has is a record of having attained lots of belts without placing lots of big names under them. It’s now being said the man was a hype job from the word go. Perhaps that assertion is the correct one. Perhaps Broner was never as good as advertised. Perhaps he was simply never going to become as good as advertised, even if he took his profession seriously, which – until recently – he didn’t seem to on any sort of regular basis. The question, of course, is where to from here for the Cincinnati native. Many, if not most, hope he will fade away. Don’t expect him do, though. Broner’s colorful image is still marketable, even on a smaller scale than it used to be. There’s still titles and lots of money available for the man in the future. Keep in mind that he’s fun to watch fight – and that people also like renegades (and Broner is most certainly that). The truth is that Broner took a tough loss and if he’s not the total hype job some are saying he always was, he’s going to want to grow as a fighter – as in actually pick up new things. That might take a bit of learning, but he’s still a young man with a considerable amount of God given talent at his disposal. The story of Adrien Broner might still have some more chapters to go. He’s going to have to play is smart, though, if he hopes to eventually go out on top…if it’s even possible for him to go out on top at this point. A legend in the sport of boxing lost to a man that nobody thought he would lose to on Saturday in Brisbane, Australia. Manny Pacquiao is a sure fire first ballot hall of famer and is an eight division world champion. Since 2005 almost all of his fights were made available exclusively on Pay Per View. However, many were stunned to see Jeff Horn be named the victor and were left in disbelief. Many, including the announcers on ESPN, strongly felt that Manny was robbed and clearly won the fight. Is this the end of Pacquiao’s career? What does this mean going forward? Here are five post fight thoughts from the Pacquiao vs. Horn fight. This may come as a shock to some, but Pacquiao was not robbed. I’m not saying he didn’t win the fight, but you can’t argue with the judges who felt Horn won the fight. Pacquiao didn’t dominate any round with the exception of the ninth, and many, many, rounds were “swing” rounds and could have been scored either way. Fans have to remember that crowd reaction affects judges and this fight took place in Horn’s home country. Most of the fans in attendance were rooting for their fellow Australian and were reacting positively to every punch that Jeff Horn threw. Yes, judges are supposed to be able to block out the sound and view a fight objectively, but that’s easier said than done and no judge is completely immune to the vocal support that surrounds him. Fans also have to realize that viewing a fight live is much different than viewing a fight on TV. When you’re watching a fight on TV you can be swayed by the commentary of the announce team and you have a much better view/angle on the action inside the ring than those who are watching the fight in person. Ring side judges do not have the advantage of wide camera angle and often their views are obstructed by the ropes, ring, competitors, and the referee. Additionally, Jeff Horn pressed the action and was able to dominate the exchanges when they were in tight or when Pacquiao’s back was against the rope. Ring Generalship and effective aggression are two criteria that judges use to judge a fight, and it was clear that Horn was dictating the pace to Pacquiao and never stopped coming forward. Again, I’m not saying Pacquiao didn’t win the fight, I’m merely stating he wasn’t robbed. Many upset boxing fans point to the CompuBox statistics as evidence that Pacquiao was robbed. They note that Horn only landed 15% of his punches and that Pacquiao landed almost 100 more punches. However, fight fans have to understand that CompuBox punch totals are done by a person sitting ringside keeping a manual tally. There is nothing scientific or reliable about CompuBox, at best it is an estimation. CompuBox also doesn’t take into consideration the visible effects of the punches landed. As a general rule punches are more noticeable when a bigger man lands against a smaller man, and Jeff Horn was clearly the bigger man. When his punches landed they visibly moved Pacquiao and many of Pacquiao’s punches were not noticeable to the untrained eye. As a fight city, Las Vegas is overrated. Yes, it’s the gambling capital of the world and very few locations can compete with the purse sizes that Las Vegas provides. But, if you’ve ever gone to a fight in Las Vegas you’d know that most of the fans who attend a big fight in Las Vegas are more concerned with the glitz, glam and celebrity that Las Vegas provides instead of the action in the ring. I’ve been to Vegas several times for big fights, and a good 95% of the fans in attendance do not show up until a few minutes before the main event starts. 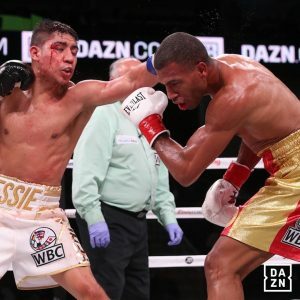 Most of the fans at a Las Vegas fight do not know the difference between a jab and a cross and are more concerned with looking good at a big event. The Pacquiao Horn fight was held in an outdoor stadium in Australia and came across great on television. 50,000+ fans were in attendance, a number that currently can not be reached in Las Vegas. The excitement and anticipation of a fight comes off much better in a big stadium when compared to Las Vegas, and makes it more attractive to the casual sports fan. The Klitschko vs. Joshua fight was held at Wembley Stadium and was one of the best fights of the year. The crowd was unbelievable and that fight also looked great on television. The most entertaining fight that this writer ever attended live was when Pacquiao fought Margarito at the home of the Dallas Cowboys, AT&T Stadium. The venue was a big reason as to why that fight was so entertaining. Granted, there will still be fight fans who only show up for the main event if a good boxing card were to be held outside of Las Vegas, but the overall experience is much better when it’s held in a stadium. Ever since Pacquiao made the jump to the junior welterweight division and higher he has been the smaller man inside the ring. His walk around weight is near the welterweight limit and he often has to fight someone who has cut 10-20 pounds to make the welterweight limit. When Pacquiao was in his prime his movement and endurance was good enough to run circles around his opponent so that they couldn’t catch him. He’s no longer in his prime and Jeff Horn was able to capitalize on his size advantage and trap Manny on the ropes with effective body work. If Jeff Horn was able to trap Pacquiao imagine what some of the other top welterweights could do to him. Keith Thurman, Errol Spence Jr., Kell Brook, Shawn Porter, and even Lucas Matthysse are all opponents that are bigger than Pacquiao and would probably inflict more damage on him than what Horn did on Saturday. Even though the current version of Pacquiao would still be competitive with most of the welterweights ranked in the top ten, he is risking serious damage to his body and health if he continues to campaign against bigger and stronger opponents when he is pushing 40. Should Pacquiao retire? That’s a tough question but at the very least it should be discussed amongst him and his team. But one thing that we learned on Saturday night is that even the faded and aged version of Manny Pacquiao is still exciting in the ring. His fight with Jeff Horn dominated social media and ESPN and has been the talk of the sports world for the past two days. Fight fans were on the edge of their seat the entire fight and the ninth round was one of the most thrilling rounds of the year. The ratings support the entertainment value of Pacquiao. ESPN recently released a press release indicating that the fight delivered a 2.4 overnight rating and was the highest rated fight for a cable network this decade. The release also indicated that the Battle of Brisbane was likely to be the highest-rated fight on ESPN’s networks since the mid 1990s. The current version of Manny Pacquiao may have difficulty reclaiming a world title in the welterweight division, but he still draws eyes to the TV.